Buildings, systems and equipment change over time. Performance may decline. Components may break or fail. Other needs may arise. To deliver the desired results, everything needs maintenance. Technology continues to evolve. Building owners and staff often struggle to stay current, leverage existing systems, and do more with less. They have to manage existing systems and infrastructure while juggling challenges such as budget constraints, staff productivity, regulatory standards, occupant comfort, safety and energy mandates. Because they’re always making choices involving trade-offs, it’s critical to get the right information to the right person at the right time for more informed decision-making. Monitor-based commissioning (MBCx) tools do just that. MBCx provides intelligent control, management flexibility and meaningful analytics to improve infrastructure efficiency by enabling scheduled maintenance and minimizing downtime. And software for energy procurement and sustainability planning helps set an energy strategy and adds money back to the operating budget. MBCx is all about fine-tuning systems and equipment and enabling facilities staff to respond effectively to expected and unexpected changes. Staff needs to understand why specific issues arise and which remedies will drive operational efficiency, mitigate risk and improve the value of existing assets. MBCx tools leverage manual remote monitoring services or advanced analytics engines to continuously diagnose facility performance and identify equipment and system faults, sequence of operations improvements, and trends in system and energy use. They consistently help staff maintain a building’s performance at desired levels over time. Systems and equipment professionals are in the best position to assess whether the benefits of achieving the desired results will outweigh the costs to implement specific improvements. In many instances, though, improvements ultimately accelerate a return on investment (ROI), extend equipment life and reduce energy costs. Many facilities may already have building energy management systems (BEMS). But they may not be making the most of that technology. MBCx provides an opportunity to maximize that technology, document each system’s capabilities, and create a truly optimized facility. Even new buildings can benefit from MBCx, especially those designed to adhere to tight tolerances for energy and ventilation codes because they require more frequent maintenance. Improperly monitored and maintained systems may lead to increased energy use and higher costs. 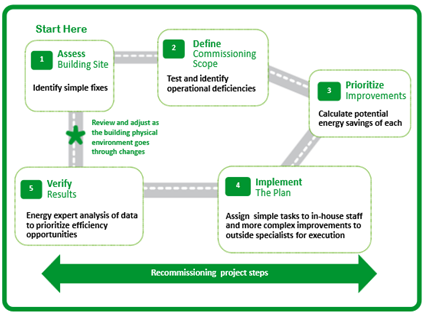 The following graphic illustrates a 5-step process that helps facilities staff identify problems, facilitate long-term planning, and reduce energy waste and operational risks. Every form of commissioning assesses design, function and current operation of a facility. The main difference in each approach is the frequency and level of change in building use. The MBCx strategy helps quickly pinpoint problems related to operations, control and maintenance while facilitating long-term planning and major maintenance budgeting. 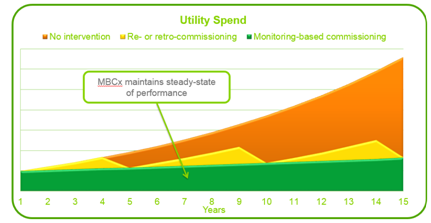 MBCx also helps reduce energy waste and validates the energy-efficiency of building equipment, minimizing maintenance costs and the potential for premature equipment failures. How do you see yourself implementing MBCx strategy? Let us know in the comments below!